Yeah, neither Jamison or Arenas have gotten any love this season. Still can't believe they didn't get a spot on the East All-Stars. 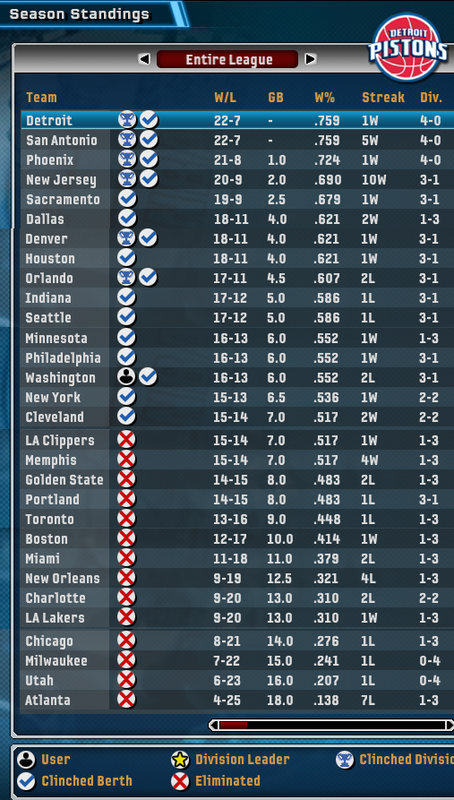 I figured Charlotte would be an easy sim win, but I was wrong apparently. I can appreciate the element of chance, though. I never played Live, so I don't know if this is true, but it appears those games valued "names" more than "stats." Like Shaq, despite having an impressive 1 steal a game for a 7' 300+ lb man, leading the league in MVP votes in this '06 world seems to be a bit of stretch. Someone can correct me here if that conclusion is wrong. 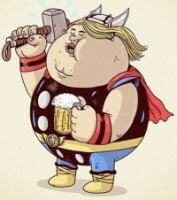 Anyway, hopefully, your Wizards can avenge the lack of acknowledgment with a good run into the playoffs. Sim engines were far more primitive then. 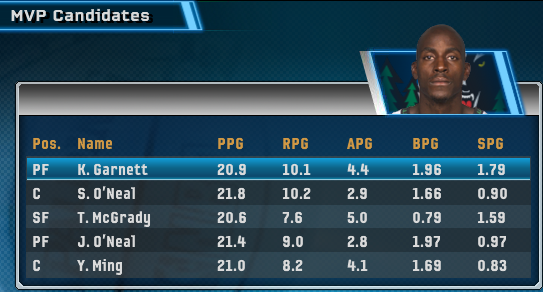 Kobe being injured and having his Primacy recalculated probably doesn't help matters with the MVP race, and Shaq's default ratings still had him primed for an All-Star performance in NBA Live 06. That should be an exciting first round match-up, and a good challenge. Are the Suns headed to the finals here as well? Btw I admire people who play older games. I don't think I could handle going back to these graphics and physics. It's a mixed bag. Sometimes the simpler approach can be fun, but you also miss the innovations and improvements of more recent titles. The biggest thing I miss in my Live 10 Rockets story is the save & quit feature; like I said before, 12 min. quarters (or even anything higher than 5-10) is daunting in one sitting. 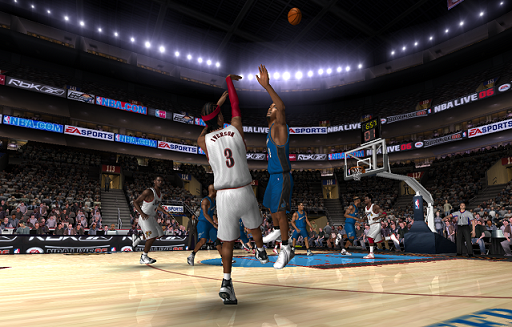 cavs4872 wrote: The biggest thing I miss in my Live 10 Rockets story is the save & quit feature; like I said before, 12 min. quarters (or even anything higher than 5-10) is daunting in one sitting. That really is one of the greatest features I think could be in a sports game. I have to plan out my entire "free time" to have the time to play the game. It's a bit daunting at times. For Live 06, I just Alt-Tab out and let it sit until I'm ready to finish. Breems wrote: For Live 06, I just Alt-Tab out and let it sit until I'm ready to finish. Yeah, I would feel a little more guilty leaving a console on all the time. Allen Iverson once named Baron Davis the most difficult defensive assignment of his career. Gilbert Arenas might share that sentiment after tonight. Baron Davis scored 29 points to go along with 4 assists and 4 steals, and J-Rich scored 18. Despite putting up his usual numbers with 25 points and 12 rebounds, Jamison's potential game-tying shot was off the mark. Arenas finished with 11 points and 8 assists but also committed 6 TOs and 5 fouls. Etan Thomas had a solid game off the bench with 12 points. I liked those Warriors more than the current group, even if they did kind of mess up the 2007 Playoffs with their upset of the Mavericks! Heartbreaker; there are a couple of players who could've done better, but it looks like Caron totally cost you the game. It seems like he's had a tough go this season finding his role on the team, as it's been all about Jamison and Arenas. You put yourself in a good situation with an Arenas/Jamison pick and roll though; can Jamison fade off the screen, or is it just straight pick and roll in this game? You can do a pick-and-pop also. I need to utilize that more. Easy games have been in short supply for Washington this season, but Washington notched their biggest win of the season tonight against Indiana. Gilbert Arenas recovered from his poor performance against Golden State with 26 points, 6 assists, 5 steals, and 4 rebounds. All Wizards starters scored in double figures, including a double-double from Brendan Haywood with 13 points and 10 rebounds. Chucky Atkins scored 14 off the bench. 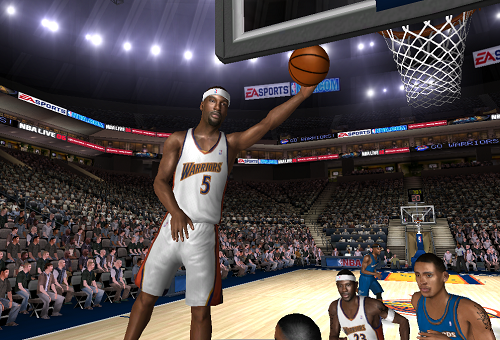 Jermaine O'Neal led the Pacers with 20 points and 13 rebounds. Stephen Jackson scored 18 and Jamal Tinsley 15, but that's all the help the Pacers would get. A strong performance there. Hopefully an indication of your Playoff form in the not too distant future! The Wizards have had multiple opportunities to grab a signature win against the league's best this season but, for the most part, have come up just short. Washington would have one of its biggest opportunities of the season tonight against the defending champs on the road. The Wallaces proved hard to contain. They combined for 30 points and 15 rebounds (8 offensive). Washington ultimately lost the rebounding battle 31-23. With Gilbert Arenas struggling to weave his way through the Pistons D, the Wizards got a huge boost from Caron Butler, who exploded for 26 points and 7 rebounds. Jamison scored 20 points and Arenas 15, but no other Wizards scored in double figures. 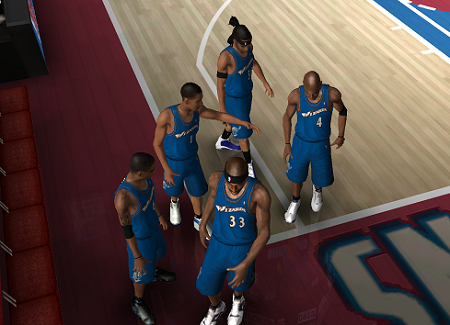 Rasheed Wallace led the Pistons with 21 points, Hamilton scored 16, Billups 14, and Prince 13. Great game. I couldn't get to the hoop with Arenas on that last possession and settled for a poor jump shot. 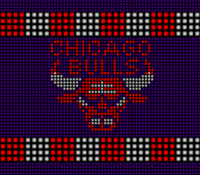 I probably should've gone with Butler who was successfully getting to the rim all night. One game left! Another heartbreaker, this time in Detroit; no shame in that. Looking forward to the postseason. Tough loss. With Arenas having Outside Scorer FSS, I'd definitely recommend driving and using either the up-and-under or behind-the-back FSS layup to get the game-tying bucket. 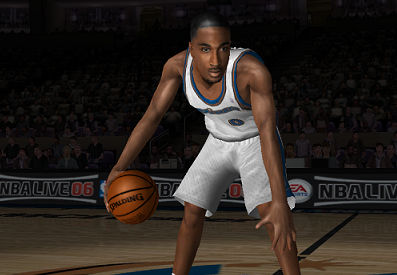 No guarantees, but generally a higher percentage option in NBA Live 06. Gilbert Arenas vs. Allen Iverson. What more could an NBA fan ask for to close out the '05-06 season? The Wachovia Center was indeed rowdy as the Wizards and 76ers took the court for one final showdown, but it only took 4 minutes for the visiting crowd to go silent. It wasn't a hot start by the 76ers or even a cold start by the Wizards. It wasn't an early 3-point barrage or demoralizing facial. The Wizards' entire season flashed before their eyes as Antawn Jamison attacked the basket off the baseline, collided mid-air with Andre Iguodala, fell awkwardly, and left for the locker room, grimacing in pain. After tempting fate with an unusual injury-free season, the Wizards could only watch in disbelief as their leading scorer and second-leading rebounder was declared out for the game and "probably longer" with a leg injury. More to come. Still, the Wizards battled to stay within 1 point at the end of Q1. 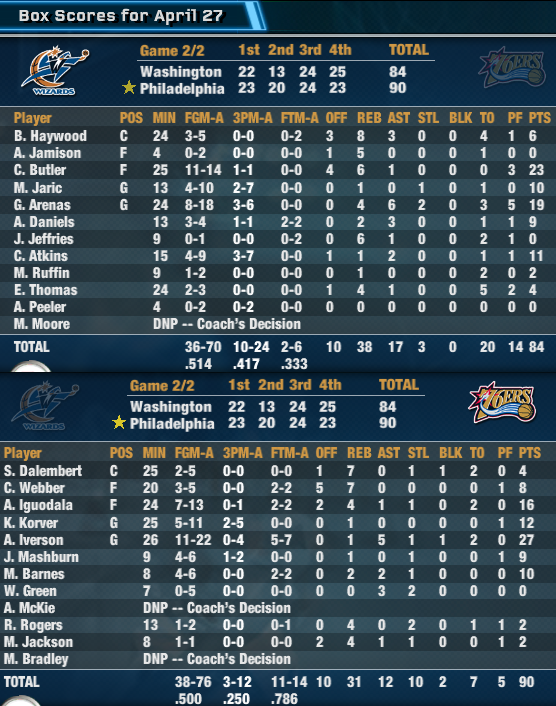 The 76ers started rolling in Q2, though, and outscored the Wizards 20-13 for a 43-35 lead at the half. Iguodala was fierce at the rim, throwing down dunk after dunk. Agent Zero helped make up for Jamison's absence offensively and worked to contain AI, but as any opposing PG can attest to, sometimes there's simply no answer for The Answer. Washington responded well after the half considering the gloomy atmosphere, but they couldn't quite get over the hump. AI led all scorers with 27 points and 5 dimes. Iguodala followed with 16 points, and sharpshooter Kyle Korver scored 12. If there was a silver lining tonight for Washington, it was Caron Butler who stepped up in a big way with 23 points on 11-14 shooting. Agent Zero scored 19 points with 6 assists, and Marko Jaric scored 10. And that's a wrap! Despite the loss and uncertainty around Jamison's injury, the Wizards are undoubtedly excited to return to the NBA playoffs with a chance to win a title. What a troll job, NBA Live! Still had fun in this game, and the injury forced me to think outside the box. Butler was huge tonight, so I hope that continues in the playoffs. Not the momentum you wanted heading into the postseason, but the bigger story is Jamison's health. 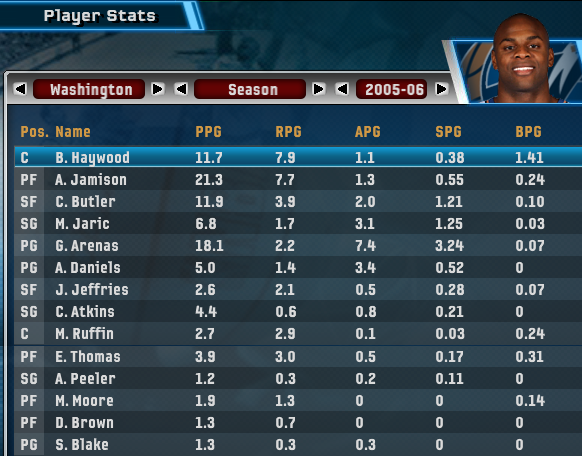 Re: [NBA Live 06] Washington Wizards | The Silver Bullet (16-13) | 2006 Playoffs! This could be the gateway for Arenas going absolutely ballistic in the postseason, but it's definitely gonna be tougher. You can breathe, Wizards fans! Just 2 days after leaving a game with an injury, the Wizards' medical staff has declared Jamison fully healthy. Washington will have their leading scorer in tiptop condition for their playoff run.